Some time back, I reviewed Basic Soap Making by Elizabeth Letcavage and Patsy Buck. I have been collecting soap recipes. Any time you start a new hobby, particularly one that requires any sort of specialized equipment, there is both expense and a learning curve involved, and I wanted to make sure I was really ready before I started. I made my first batch of soap today. It is currently saponifying (hardening into soap) in the kitchen. 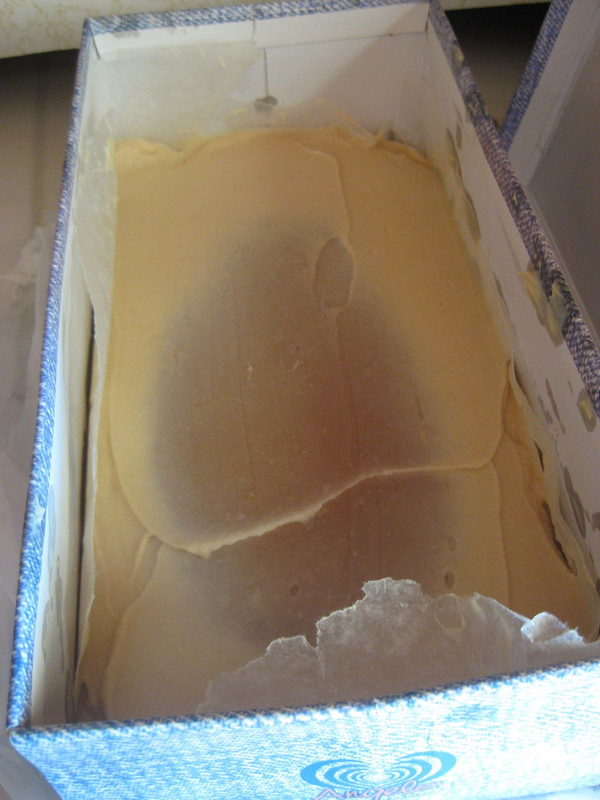 In fact, a little while ago, it looked like the soap in the picture to the left, though now, pretty much all of it is that darker color you see in the middle here. That is called the gel stage, and if you poke it, it feels like, well, a gel. After 24 hours, it should be hard enough to cut into bars, but it will have to cure for about a month before I can use it. If I were a little more handy or experienced, I would have taken pictures of the process as I went. I made the first basic recipe in the book, and I think I really expected it to flop because I was so excited when it turned out exactly as Letcavage and Buck said it would. I am really excited it turned out so well so far. I’ll know tomorrow if it worked. If you’re looking for a clear book with basic, easy-to-follow instructions for making soap, this one is definitely worth it. It’s nice when you can find a craft book with clear instructions that actually work. The pictures make everything easy to understand. I have also acquired a new iPad through work, and I have to put in a plug for the Shakespeare’s Sonnets app. It’s utterly fantastic. While $13.99 is a little high for an app, if you consider all it includes—videos of each sonnet recited or interpreted by actors or scholars, video commentary on the sonnets, written annotations, essay commentaries, and facsimiles of the original publication, as well as the ability to add your own notes and mark your favorites—it’s worth the money. In fact, if you think about it, you would probably pay close to $13.99 for a good annotated collection of the sonnets, and it wouldn’t have all the other extras. I have also discovered I enjoy watching Netflix on the iPad much more than on my computer or even my TV. It probably has to do with the computer being rather difficult for me to hold when viewing longer videos, but I’m not sure. It is similar to the issue I have with reading longer texts: I can’t read books on my computer, but articles are fine. Watching Netflix on TV through the Wii is fine, but unless I really wanted to curl up in front of the TV, I just didn’t do it much for whatever reason. Watching Netflix on the iPad, however, has turned out to be perfect for me. I decided I would finally start watching Doctor Who, which I had been meaning to check out for years—years! Finally, I started the first season of the new series, beginning with Christopher Eccleston, and I love it! I have been watching the first season most of last night and this afternoon. Something weird I notice, and I can’t stop myself: Rose Tyler’s mascara is always clumpy. It made me wonder if they had her do her own makeup. On the other hand, it lends an air of realism to the show. She seems more like a real person than an actress because her makeup isn’t perfect. I know. Weird. Surely, some of my fellow book geeks watch this show, right?